You want to get a ring, but you’re not sure of what size you need. Unless you’re a jeweler or it’s a hobby, then you probably don’t have one of those ring size thingys laying around. There are better times to measure your fingers – mainly late morning to early afternoon for most people. Some fingers tend to be smaller in the morning and some tend to swell over night, like mine do. All fingers get smaller when they are cold, so it’s best to measure mid-day at room temperature, unless you are an ice-carver by day. If you hesitate between two sizes, always go with the larger one (see above, re: swelling). If you’re looking at a wider band, move up a half or full size from your measurement. It will be more comfortable, we promise. When measuring your finger, don’t use a string or rubber band. They tend to stretch (Really?!? ), which can result in wrong size. Use a paper strip about 1/2 inch wide. 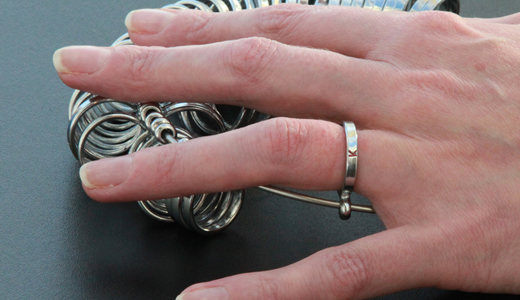 Use a simple band to test your ring size. Extra wide band styles tend to run slightly small. If your borrowed ring has a narrower shaft than the one you wish to purchase, you may wish to order a ring a size larger than the normal size worn. Also, large stone rings may cause the shank to lift up when laid on its side on the display, slightly distorting the size measurements. We hope this helps! If you have any questions, please feel free to post a comment! ← Wait! My finger turned green!